Sings Hank Williams is the seventh album by American country and rock and roll singer Johnny Cash, released under Sun Records on September 15, 1960. The album was reissued on Varèse Sarabande on June 17, 2003 as Sings Hank Williams and Other Favorites with five bonus tracks, two of them being alternate recordings of numbers already available on the album. 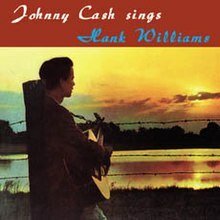 Only the first four of the twelve tracks on the album were written by Williams, with most of the others being written by Cash. (Additional songs composed by Williams are included in the 2003 reissue.) About half of the songs on the album had previously been issued on LP by Sun. Making their album debut are the tracks "Straight A's in Love", "Come in Stranger", "Give My Love to Rose", "Mean-Eyed Cat" and "I Love You Because". All tracks written by Johnny Cash, except where indicated. This page was last edited on 28 December 2018, at 03:43 (UTC).